I'm trying to get TFS (2013) to ignore my packages folder. I passionately don't want it source controlled as I'm using NuGet and it's great! I've tried cloaking (doesn't seem to work), I've tried adding .tfignore files - nothing is ignored. Why don't the TFS team just add an option to permanently ignore a folder or file like lots of the Subversion clients do?! OK, so now thanks to our .tfignore file, TFS is ignoring your packages. Everything is fine, right? WRONG, because NuGet is mucking around with your source control and adding the packages to your pending changes. So now let's tell NuGet to cut it out already. And now your packages should stay out of source control. Just remember to add the NuGet.config and .tfignore files to source control so they never get lost. EDIT: If you're having issues, you may want to delete your packages folder, check in that change, and then go through the steps above. ALSO EDIT: It looks like this won't happen with newer versions of Nuget. So maybe if you switch to VS/TFS 2017 this issue will clear up without jumping through the above hoops. 2. 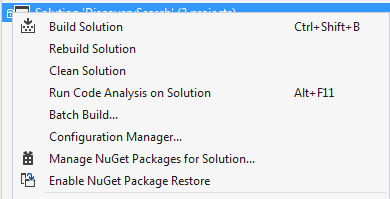 When I figured this out using VS 2013, I found the NuGet.config had to go in the .nuget folder. Even if you already have a NuGet.config file in the root of your solution folder (because, say, your company has an internal nuget feed). However, some in the comments have indicated that it works fine in the solution root in VS 2015. Personally, I switched to using TFS in git mode, so I can't test. Additionally, if you do have a custom feed, ensure that you have both the custom feed and nuget.org as keys in the Nuget.config file, or sometimes TFS will randomly decide it can't restore the packages. An alternative solution to the above is the following. It is worth noting that this solution would need to be applied per TFS workspace. It has worked far more reliably for me rather than using the .tfignore file. You can read more about this approach in the blog article Prevent TFS from adding installed NuGet packages to source control. The disableSourceControlIntegration is what makes the trick for TFS Version Control. You need to be using local workspaces for .tfignore to work. The .tfignore file must be in the folder that contains the files or folders you want to ignore. You can permanently set this once-off in your AppData\Roaming for all solutions (old & new)! ...you can specify any path you want - the important thing is putting it OUTSIDE your TFS workspace! Now you never have to worry about that stuff again. Your solution folder will not contain any packages anymore; all solutions will default to using your custom packages location instead. NOTE - This works is on a per-user basis. Set your solution to restore on build, the package folder and packages file will be checked in but the packages won't. If you are using Git with TFS you need to add a ".gitignore" file. 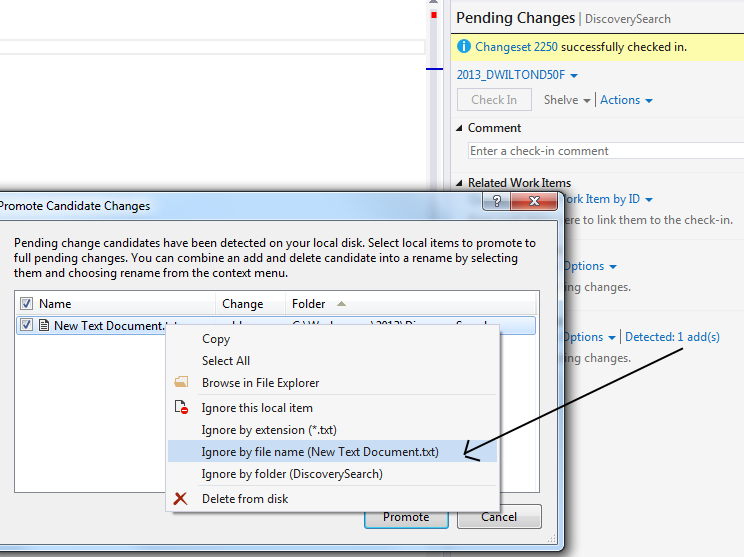 You can do this in "team project | Settings | 'add ignore file'". Then open the file and uncomment the built in ignore statement for Nuget Packages. If you are using TFVC and you have Local Workspaces configured you can use the ".tfignore" file that honours an identical format to the Git file. I think you need "packages/". This didn't work for me quite on visual studio online and VS2013. Add the .tfignore. I normally do this by adding a text file to the solution root, letting it detect that and then exclude by clicking 'detected add' > right click ignore. Check everything in, including any packages. Open the solution and build which will add the packages to the project but TFS will not pick them up. Terje's answer doesn't work all the time for me, sometimes it will work for a while, but then it will pend a load of "adds" for me all over again. The only way I have found to solve this permanently is to Cloak the packages folder in my Workspace. I had the same issue. /packages should work but didn't for me. packages*. * did work. Not the answer you're looking for? Browse other questions tagged tfs nuget or ask your own question. TFS: Why is Cloak grayed out? How do I stop TFS constantly trying to add nuget packages folder? How to ignore files/directories in TFS for avoiding them to go to central source repository? Is there a way to automatically update nuget.exe in the .nuget folder when using package restore? Specify NuGet sources for build server to use with NuGet Package Restore? How to us tfignore file for common nuget package folder?